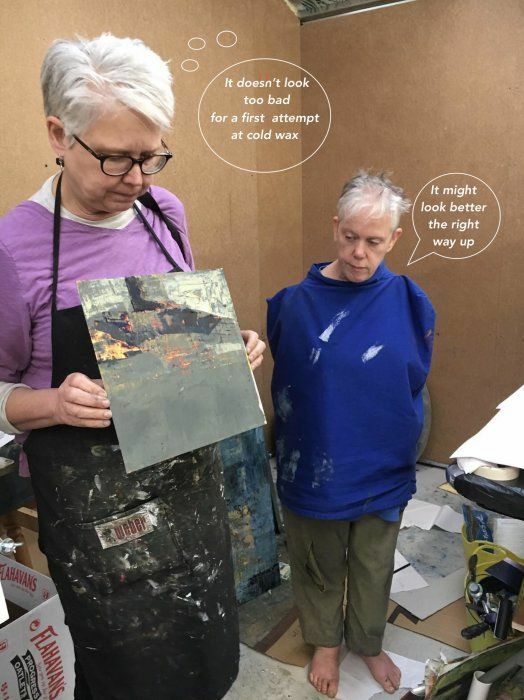 Rebecca and I reviewing one of my first cold wax paintings in Ballinglen Arts Foundation, North Mayo in 2016. I won't be listening to this week's podcast because . . the microphone was turned in my direction. Rebecca created a recording studio in my car as we sat in the windswept wilds of north Mayo, and that is why I won't be listening to this one . . However, without reservation, I can highly recommend it to you . . as each and everyone of the other podcasts is great, and this one should be no different (ouch). Look, if you like, skip this latest one (mine), with blessing, but please do listen to the rest. They’re perfect. And don't forget to give the Messy Studio loads of stars if ,like me, you rate it very highly.